Yes, I was sure. 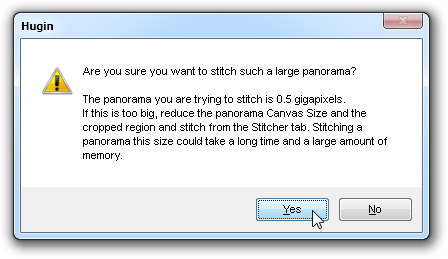 The panorama is 31,676 by 15,838 pixels, or 502 megapixels - and it's still fairly editable in Photoshop. The biggest problem with it was that my version of Photoshop doesn't support saving JPEG:s larger than 30,000 pixels along any axis, so I had to save it as TIFF, fire up a VM with Ubuntu, and use ImageMagick[b] on the TIFF file to turn it into a JPEG.